Thyme is an herb with many culinary and medicinal purposes. The entire plant has been commonly used in the treatment of diarrhea, stomachache, arthritis, sore throat, cough, bronchitis, and gas. Thyme is an herb with many culinary and medicinal purposes. The entire plant has been commonly used in the treatment of diarrhea, stomachache, arthritis, sore throat, cough, bronchitis, and gas. Thyme contains antibiotic properties that can help fight a cold, cough, or even a sore throat. According to a study, the herb is known to treat bronchitis and cough. Oral treatment of acute bronchitis with a thyme-ivy combination for about 11 days was better than using a placebo. These same properties have also shown to defend individuals from food-borne bacterial poisoning. Studies have suggested that thyme oil is effective in killing bacterial strains of Staphylococcus, Enterococcus, Escherichia, and Pseudomonas. After consuming foods that can cause bloating and gas, thyme can reduce the amount by the help of certain powerful compounds that it contains. Thyme reduces the amount of methane and lactate produced in the body. 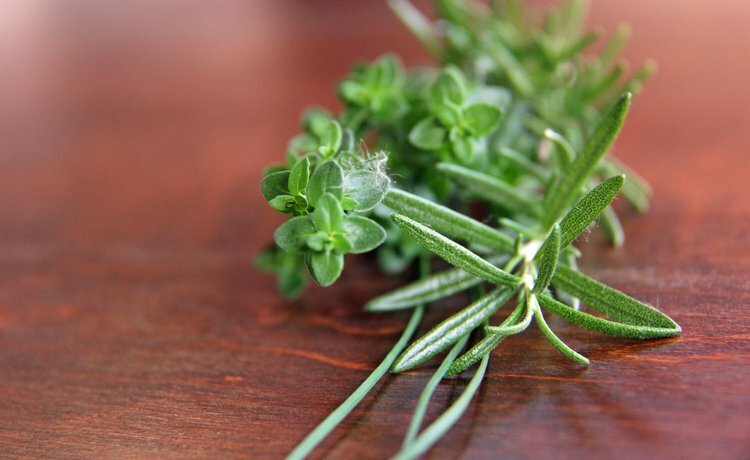 After digestion, thyme can help individuals have better blood quality. For example, wild thyme may reduce blood pressure. Researchers at the University of Belgrade used rats to test the blood pressure effects because they have similar hypertensive situations as humans, and they obtained encouraging results. Thyme also improves the blood cell quality of an individual. Thyme is an excellent source of iron, essential for energy production and the making of red blood cells, which carries oxygen to cells. Iron insufficiency may cause anemia, fatigue, and make the body more inclined to illnesses. Scientists have also found that thyme may help fight various forms of cancer such as colon and breast cancer. Wild thyme induced cell death in breast cancer cells. Thyme may also help battle yeast infections. Thyme essential oil significantly enhanced the elimination of Candida albicans, a fungus responsible for mouth and vaginal yeast infections. People are also very sensitive about their physical appearance. Thyme may serve as nature’s acne prescription cream by killing the bacterium that causes acne, called Propionibacterium acnes, within five minutes of exposure. Scientists from Leeds Metropolitan University in England found that thyme was even more effective than standard concentrations of benzoyl peroxide, the active ingredient found in acne washes and creams. Thyme may also help alleviate other skin problems. The All African Leprosy and Dermatology Education and Training Center reported that 66.5% of individuals who used ‘thyme essential oil’ fungal cream were completely cured of fungal infections, compared to only 28.5% of those using other products or placebos. With these various health benefits of thyme in mind, it appears that thyme is a versatile herb. It may be added to dishes or even prepared as thyme tea. Also, thyme makes a perfect product for individuals who want to use natural substances. Thyme can help fight fungal and bacterial infections too. Bozkurt, E., Atmaca, H., Kisim, A., Uzunoglu, S., Uslu, R., & Karaca, B. (2012). Effects of Thymus serpyllum extract on cell proliferation, apoptosis and epigenetic events in human breast cancer cells. Nutrition and cancer, 64(8), 1245-1250. Gordo, J., Máximo, P., Cabrita, E., Lourenco, A., Oliva, A., Almeida, J., ... & Cruz, H. (2012). Thymus mastichina: chemical constituents and their anti-cancer activity. Natural product communications, 7(11), 1491-1494. Kemmerich, B., Eberhardt, R., & Stammer, H. (2006). Efficacy and tolerability of a fluid extract combination of thyme herb and ivy leaves and matched placebo in adults suffering from acute bronchitis with productive cough.Arzneimittelforschung, 56(09), 652-660. Mihailovic-Stanojevic, N., Belščak-Cvitanović, A., Grujić-Milanović, J., Ivanov, M., Jovović, D., Bugarski, D., & Miloradović, Z. (2013). Antioxidant and Antihypertensive Activity of Extract from Thymus serpyllum L. in Experimental Hypertension. Plant foods for human nutrition, 68(3), 235-240. Park, Y. U., Koo, H. N., & Kim, G. H. (2012). Chemical composition, larvicidal action, and adult repellency of Thymus magnus against Aedes albopictus.Journal of the American Mosquito Control Association, 28(3), 192-198. Palaniappan, K., & Holley, R. A. (2010). Use of natural antimicrobials to increase antibiotic susceptibility of drug resistant bacteria. International journal of food microbiology, 140(2), 164-168. Silva, N., Alves, S., Gonçalves, A., Amaral, J. S., & Poeta, P. (2013). Antimicrobial activity of essential oils from mediterranean aromatic plants against several foodborne and spoilage bacteria. Food Science and Technology International, 19(6), 503-510. Golec, M., Skórska, C., Mackiewicz, B., & Dutkiewicz, J. (2002, December). Health effects of exposure to thyme dust in a group of thyme growing farmers. In Annales Universitatis Mariae Curie-Sklodowska. Sectio D: Medicina (Vol. 58, No. 1, pp. 195-203). Connolly, M., Thomas, J. M., Orford, J. A., Schofield, N., Whiteside, S., Morris, J., & Heaven, C. (2014). The impact of the SAGE & THYME foundation level workshop on factors influencing communication skills in health care professionals. Journal of Continuing Education in the Health Professions, 34(1), 37-46. Al-Turki, A. I. (2007). Antibacterial effect of thyme, peppermint, sage, black pepper and garlic hydrosols against Bacillus subtilis and Salmonella enteritidis. JOURNAL OF FOOD AGRICULTURE AND ENVIRONMENT,5(2), 92. Abu-Darwish, M. S., Abu-Dieyeh, Z. H., Mufeed, B., Al-Tawaha, A. R. M., & Al-Dalain, S. Y. A. (2009). Trace element contents and essential oil yields from wild thyme plant (Thymus serpyllum L.) grown at different natural variable environments, Jordan. Journal of Food, Agriculture & Environment,7(3&4), 920-924.